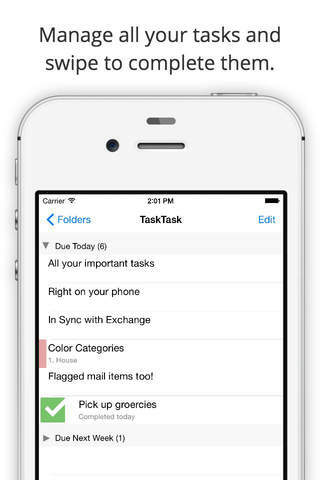 TaskTask is a simple yet powerful task management system for your iPhone and iPod Touch. TaskTask synchronizes with most Exchange servers to keep your tasks in sync between your mobile device and Outlook with ease. Using TaskTask, you can manage your to do list, including creating tasks, setting start/due dates, marking tasks complete, assigning categories, changing importance, setting and receiving reminders, and deleting tasks. An Exchange Server account is required to synchronize tasks between Outlook and TaskTask. TaskTask is not compatible with Gmail, Comcast, or other non-Exchange e-mail accounts. Note: To synchronize your tasks with Outlook, your e-mail account must be on a compatible Microsoft Exchange Server. Exchange versions 2003, 2007, or 2010 versions are supported, although there may be additional factors that prevent TaskTask from working with your server. If you are using Mail.app or Microsoft Outlook 2011 (Macintosh) with your mailbox in "Exchange" mode, then TaskTask is compatible with your server. There are specific requirements for your server, which are detailed on our website. Before you purchase TaskTask, please verify with your e-mail administrator that your server meets these requirements. If you have any problems with installation or in-app purchase, found bugs, questions, comments about this application, you can visit the official website of Ryan Gregg LLC at http://tasktaskapp.com/. Minor update that resolves a couple of bugs that slipped through in our big 5.0 release. Now updated for iOS 7 compatibility! Version 4 has been significantly updated to work great with the new iOS, including a refined visual experience and background fetch support to stay always up to date. Compatible with iOS 6 and iOS 7. Additional visual theme - Based on user feedback, TaskTask now includes an additional color scheme for users who prefer the black & white experience from our previous versions. 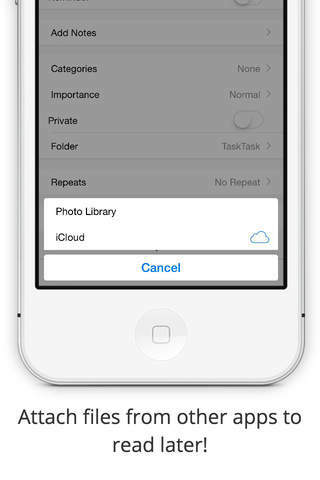 Gesture tweaks - Based on user feedback, the delete swipe gesture has been tweaked to make it more difficult to accidentally delete a task. Now you must swipe half way across the screen until the X turns red. Bug fixes: Fixed issue with notes not scrolling on some iPhone devices. Fixed issue where attachments are with attachments were not being downloaded. Fixed issue where subject changes were lost when tapping on the reminder switch.